At Tania’s Mexican Restaurant, it’s all about authentic flavors, family, and achieving the American dream. “A lot of customers compliment us on the taste—the Hispanic community says Tania’s tastes like home, and Americans who have been to Mexico say, ‘It’s just like being in Mexico,’” says Manager David Angeles, 23, translating for his parents, restaurant Owners Marcelino, 48, and Maria, 45. The Angeles family has remained true to their Mexican roots, while putting down new roots here in Adams County. Marcelino came to the U.S. in 1988, following his brother to Adams County. The couple, sweethearts since their teens, was married shortly after Maria came to America in 1989. Both achieved U.S. citizenship. Tania’s opened in Aspers in 2005, followed by a downtown Gettysburg location in 2013; the classic Mexican restaurants are named for David’s sister, the youngest of three children. Family traditions shape every aspect of the restaurants’ operations. The family starts every day by preparing a staggering 500 pounds of homemade tortillas. With a dozen tortillas per pound, that adds up to 6,000 tortillas a day. “What makes our dishes so authentic are the spices, the chili peppers—honestly we don’t use anything out of a can—everything is homemade, fresh, or true Mexican products from Mexican suppliers,” David says. The extensive menu offers a “fiesta” of breakfast, lunch, and dinner options: tacos, tortas (sandwiches), quesadillas, sopes (thick corn tortillas), salads, specialties, combinations, plus desserts. One of their most popular entrees is Enchilades de Mole con Pollo o Queso (enchiladas with mole sauce, chicken, and queso cheese). Maria quickly lists the dish’s key ingredients: The mole sauce combines chocolate with dried chilies, cinnamon, peanuts, and pecans; it accompanies the enchiladas—corn tortillas wrapped around tender chicken, with a drizzling of creamy queso. Spicy Pork and Pineapple Tacos are served with colorful Mexican flair. “The pork is marinated with various chilies, vinegar, garlic, onion, plus spices—cumin, oregano, cinnamon—then sautéed with pineapple,” David translates from his mother. Accompaniments include grilled scallion, cactus, and jalapeño pepper. Don’t let the word “spicy” scare you away—the spice level is relatively mild. Guests can even choose from three beverages made in house: Jamaica is similar to a tea, brewed from hibiscus flowers, which turn it a deep red color. Tamarind, brewed from the fruit of a tropical tree, has a tangy, fruity flavor. Horchata, a traditional Mexican drink, is steeped with rice pudding’s ingredients, blended, and then strained, creating a sweet, milky beverage infused with cinnamon. Mexican desserts include Three Milks Cake, literally made with three types of milk. The moist vanilla cake features a central layer of fruit—strawberries, pears, peaches, or pineapple—and is often served at Mexican birthdays or weddings. 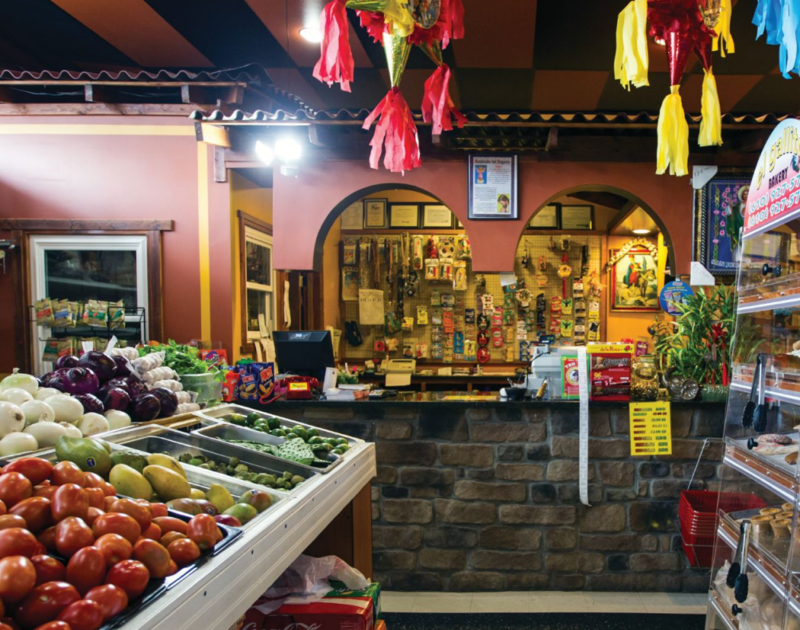 Within the restaurant is a thriving Mexican store bursting with color and stocking everything from Mexican candy, pastel-colored pastries, masa (similar to cornmeal), and pickled pigskins. Fresh produce includes chilies, cactus, limes, and tomatillos. Every day between the lunch and dinner crowds, the Angeles family gathers around one of the restaurant’s tables to enjoy a family meal together. What is next on the horizon? The family envisions opening additional restaurants in York, Carlisle, or Chambersburg.